NXP FTF Tech Forum in Austin has been a blast! I’m running another FreeRTOS hands-on session (FTF-DES-N2048) this afternoon which yet again is fully booked. But we will squeeze in as many as possible from the waiting list. I expect this will come out with one of the upcoming Segger J-Link software releases. 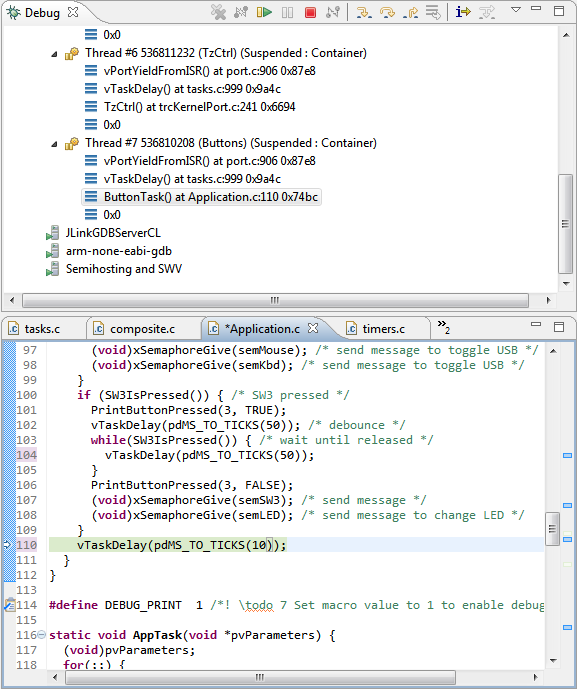 I’m using the NXP Kinetis Design Studio for the above, but this should work for any Eclipse using the GDB server from Segger. 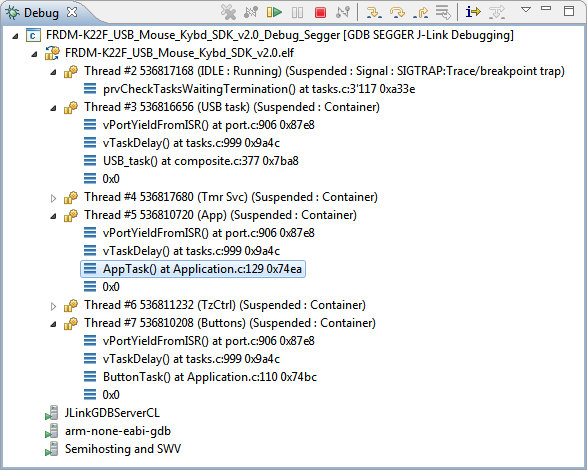 NXP Kinetis Design Studio included the Segger GDB Server, and if you do an update with the Segger J-Link software, it can update the Segger files inside the IDEs which are detected. So this could be rolled out with one of the next Segger J-Link software updates. This entry was posted in ARM, Boards, CPU's, Debugging, Eclipse, Embedded, FRDM-K22F, Freescale, KDS, Kinetis, NXP, Tips & Tricks and tagged Debugging, Eclipse, freedom board, FreeRTOS, Freescale, FTF, OpenSDA, Segger, software, technology by Erich Styger. Bookmark the permalink. I’m very happy to hear that!! is there a ETA for this new gdb server ? Segger released beta V5.42h which includes plugins for both embOS and FreeRTOS. I don’t see any FreeRTOS plugins in V5.41h and and I don’t see any reference about FreeRTOS in the release notes? Why do you think it is included? The plugins are located in the folder ‘GDBServer’. Add ‘-rtos GDBServer\RTOSPlugin_FreeRTOS’ to the command line to use the FreeRTOS plugin. Ah, I see it now. I’ll have a look. I quickly tried the plugin with my FreeRTOS project on a FRDM-K64F (ARM Cortex-M4F), and it works. At least I don’t see that error message. There is only one thing that for one thread it does not show properly the call stack (which I’m going to report to Segger). But otherwise it seems to work fine. I’m writing up a short article on how to setup things too, so thanks for your pointers and tips! Maybe it has something to do with the FreeRTOS version? I’m still at version 8.1.0 but i want to upgrade to 9.0.0 in the near future. What version did you use for testing? I upgraded FreeRTOS to version 9 but i’m still having the same problem.. There is probably something wrong in my environment but i have to figure out what exactly. BTW my target is an LPC1768 and i’m using the LPCXpresso IDE. I received a reply (very fast!) from Segger. My problem was caused by compiler optimizations (I used -O3) and vPortEnableVFP() was optimized away. Can you check in the Segger GDB log that you each symbol is defined and does not have an address of zero? I tried different optimization levels but none of them seems to fix my problem. I also checked the GDB log and there is no mention of any of those symbols, not even that they are not found. I assume they should be in the log where ‘ERROR: Don’t have the number of threads in FreeRTOS.’ is now. Strange, because all of those symbols are in the binary and i can see them in the expressions view of eclipse while debugging so for some reason the plugin is not getting the symbols. ERROR: Don't have the number of threads in FreeRTOS. you need to check the Segger GDB log. This is where I have these lines from. I’m quite getting out of ideas. Why does it work for others but not for me.. I have contacted Segger. I suspect that in your FreeRTOS some symbols are not found. Below is my log, in case this helps. All mandatory symbols successfully loaded. In the mean time, i installed the segger jlink plugin from gnuarmeclipse and now it finally works!